F-Stop Magazine: The current issue of F-Stop Magazine features your project “Hidden Mothers” – Please tell us more about this project, and what led you to creating this work. Megan Jacobs: A few years ago, I came across the book The Hidden Mother which is comprised of a collection of historic “hidden mother” images that artist Linda Fregni Nagler collected from antique shops, Ebay, and other locations over many years. I became interested in the Victorian practice of making hidden mother images and started thinking about how it functions as a kind of visual metaphor for aspects of motherhood today. When I share the work I usually show daguerreotype or tintype images of hidden mother images to historically contextualize the work. I explain that my series Hidden Mothers references this early usage of photography when exposure times were long. 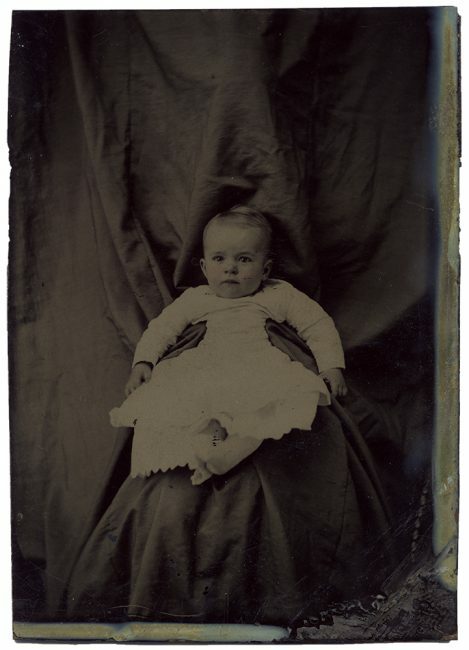 During this time, mothers who wanted a record of their children were instructed to hide themselves under a piece of fabric and hold their children for the duration of the exposure to ensure a sharp image. Inspired by these historic images, my work creates formally similar images in contemporary times, as a metaphor for the unrecognized work that mothers do to support, provide for and nurture their children. In the images, each mother is wrapped in a floral bed linen that elicits traditional notions of femininity and domestic spaces. 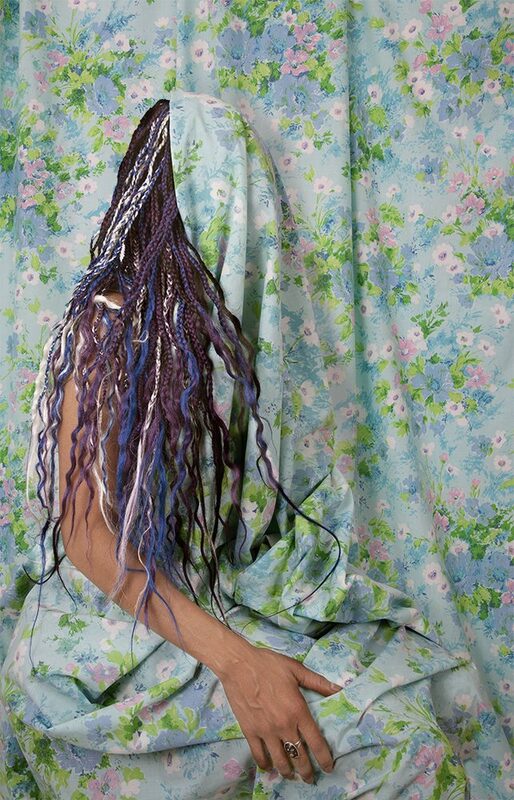 There is a tension between hiding and revealing: the mothers’ identities are obscured, yet the vibrant sheets accentuate their presence, while in other instances aspects of their identities are exposed. This interplay explores the complexities of motherhood and functions to illustrate the mutability of identity and in some instances an erasure of self. Mothers are navigating a world where their roles as a nurturer can feel sidelined and invisible. In an era when mothers are experiencing statistically increased parental time commitments coupled with rising childcare costs, mothering is not only personal, but political. F-Stop: Please describe your process for making these images; how did you work with the mothers and children for this series? MJ: Over the course of the project I collected vintage linens that elicit traditional notions of femininity and domestic spaces. Often these patterns match those that I remember from my childhood. To find subjects, I started by reaching out to family and friends, as well as a local group to find mothers and their children. 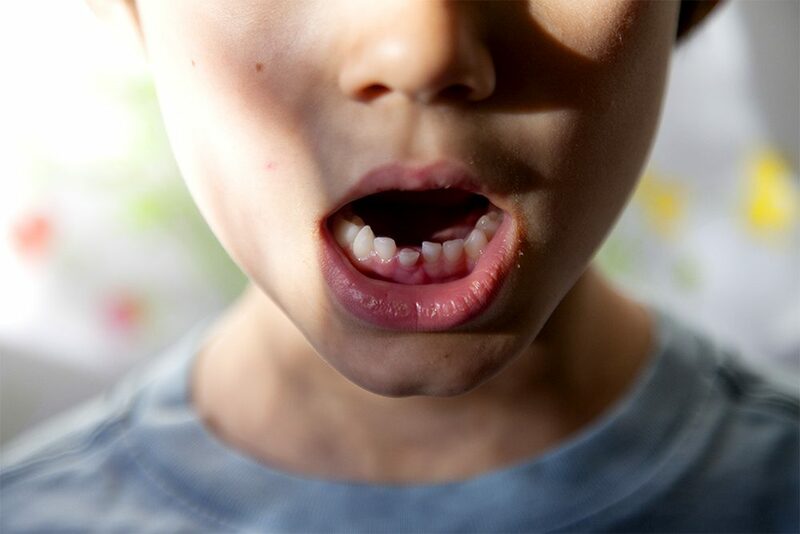 This is my first foray into photographing children, other than my own, so I knew my time would be limited with each subject. My studio has large south facing windows so the images are comprised of a combination of natural and strobe lighting. Since I don’t know what each child will wear, I have to make quick decisions once the subjects arrive. I find visual connections between the child’s clothing and the vintage linens. After some discussion with the mother and child I begin to photograph. Often, we play a game of peekaboo with younger children so they start to understand that their mother is hidden under the linen. 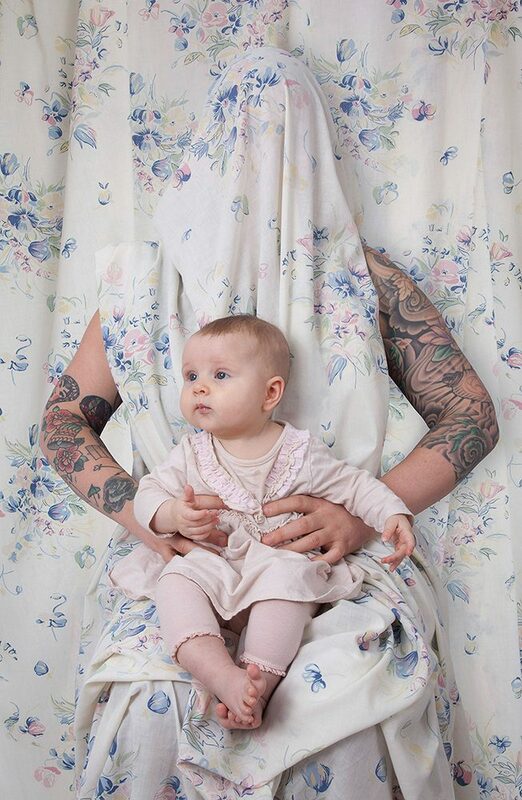 The subjects are photographed with a white background while the mother is covered in the vintage linen. Once the final portrait is selected, I integrate images of the sheet on its own with the portrait through masking techniques in Adobe Photoshop. 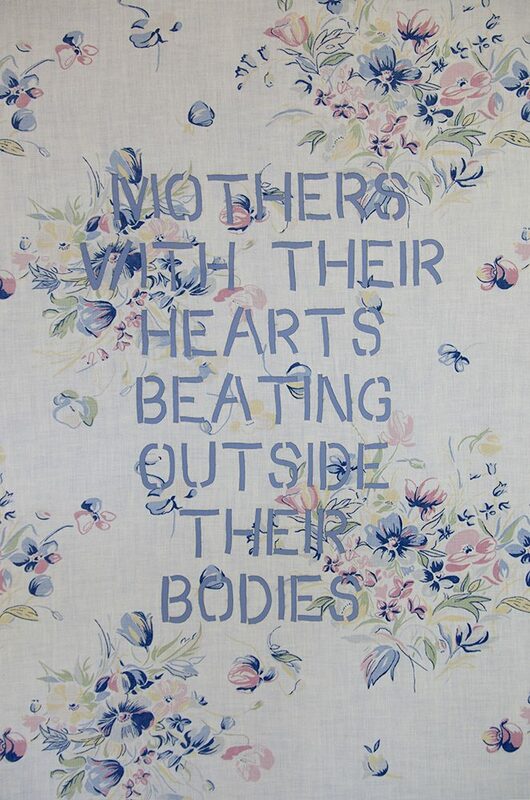 The final portraits are paired with panels with matching vintage linen with excerpts of quotes on motherhood. MJ: I grew up in a small town in downstate Illinois. My high school arts program was small and didn’t include photography. However, I was fortunate enough to attend Semester at Sea, a floating classroom that circumnavigates the globe, with my mother who was a professor on the ship. I was able to take my first photography course onboard with photographer, Cheryl Klauss. She taught me how to see the world through photography, and how to use my camera as a passport to record the world around me. Cheryl taught me how to develop film and make silver gelatin prints. Comically, I learned to process my film and print my photographs in the “hold” of a ship – so very little agitation was necessary! Later, I pursued photography as an undergraduate at Smith College and worked with Delilah Montoya and Meridel Rubenstein where I began to create fine art photography in dialogue with more sculptural presentation methods. I earned my MFA at the University of New Mexico in photography and worked with Patrick Nagatani and Adrienne Salinger who encouraged me to create sculptural time-based work in dialogue with my photography works. 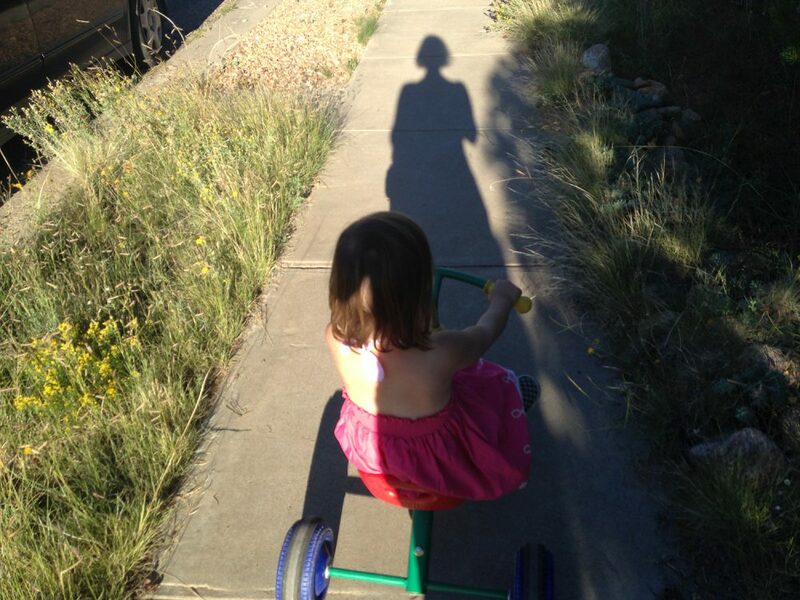 It was at UNM that I became cognizant that my work, no matter what the medium, orbits around delicate relationships—our existence as material and concept, the interweaving between two partners in love, and the bond of parent and child. F-Stop: What do you hope people experience or feel when they look at your photographs? MJ: I hope that the viewer is held, at least momentarily, by the beauty of the images and ideally is compelled to look more deeply in order to unpack the meaning/s of the work. Perhaps it’s a lofty goal, but I hope the viewer feels a connection with the subject, or that the photograph forges a sense of empathy. MJ: The image, Hidden Mother: Eileen, is one of my favorite photographs in the series. The image depicts a mother covered in a lilac-colored floral bed linen while nursing her young daughter. Breastfeeding is a powerful connection between mother and child and one that is also politically fraught. In some contexts, mothers are shamed for not “covering” their bodies while nursing. In other situations, mothers feel inadequate if they can’t or opt not to breastfeed their babies. While the political issues are numerous, what I loved about making this image was how naturally it came about. The baby was a little squawky and the mother knew she was hungry and fed her. I asked the mother if it was okay to photograph her while she breastfed, and she agreed. The subject was comfortable with her body and its role to nourish her child. F-Stop: In another interview, you’ve listed some photo influences of yours to include Rinko Kawauchi, Sally Mann, and Cig Harvey. You’ve listed these people for their various strengths, and/or their work, based on the theme of family and being ‘artist-mothers’. What kind of comments do you think other photographers make when they include their own family in their work? MJ: The narrative of the lone genius (often a male) working fervently on their art is one that art history has traditionally embraced. Fortunately, that narrative has slowly begun to change. Contemporary photographers such as Rinko Kawauchi, Sally Mann, and Cig Harvey, and Elinor Carucci embrace an example of art making that integrates one’s daily life—such as parenthood—with the process of making art. In that way, the work honors a collaborative approach (in the sense that photographer and subjects work together). Work that rejects a Kantian perspective of art and embraces art making as an extension of daily life inspires me. Intertwining the roles of mother and artist seems like a natural step in this process. This approach has helped me foster a daily recognition of the beauty and fleetingness of the world around me. Art at its best (as seen in the photographers mentioned above) challenges, encourages, and inspires us to see the world anew. MJ: Since my children were born, I have been working on an ongoing project Mi Familia which explores the vulnerability, intimacy, and joy of motherhood and familial life. Joyous, and at times melancholic, the photographs explore fleeting and momentous moments as well as the detritus of childhood: a forgotten half-eaten ice cream cone or the weightless feeling of being outside on a summer day. The work seeks to create empathy, illicit nostalgia and honor the sanctity of childhood through the creation of moments filled with the magic of play, and the captivating aspects of nature as seen through a mother’s eyes. On different note, I’m in the process of gathering information and imagery to start a new photographic collage-based project which explores the conflux of materialism and capitalism and their environmental ramifications. 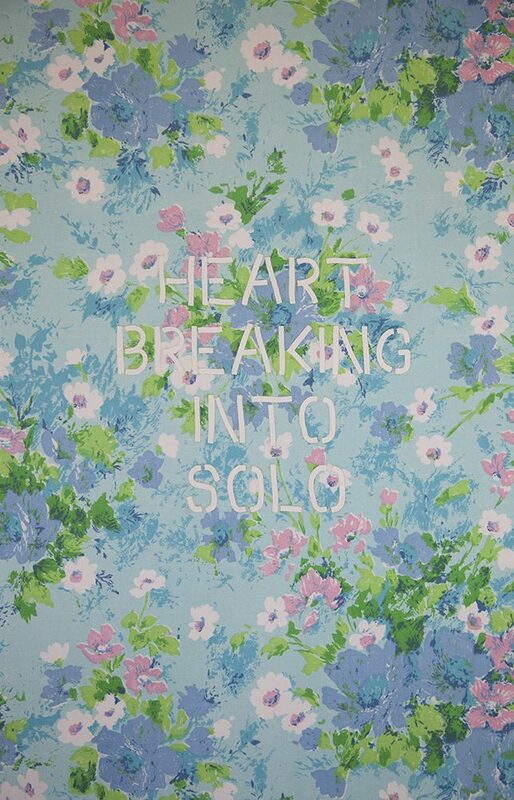 Megan Jacobs is an artist based in New Mexico. Her creative work explores delicate relationships—our existence as material and concept, the interweaving between two partners in love, and the bond of parent and child. Her work has been featured in Musee Magazine, Lenscratch, Feature Shoot, and Frankie Magazine. Her work has been exhibited nationally and internationally and has been part of exhibitions at Blue Sky Gallery, The FENCE (regional), Saatchi Gallery (online), the Museum of New Art (MONA), Pingyao Photographic Festival, and the International Symposium on Electronic Art (ISEA). Jacobs earned an MFA in photography from the University of New Mexico and a BA from Smith College. 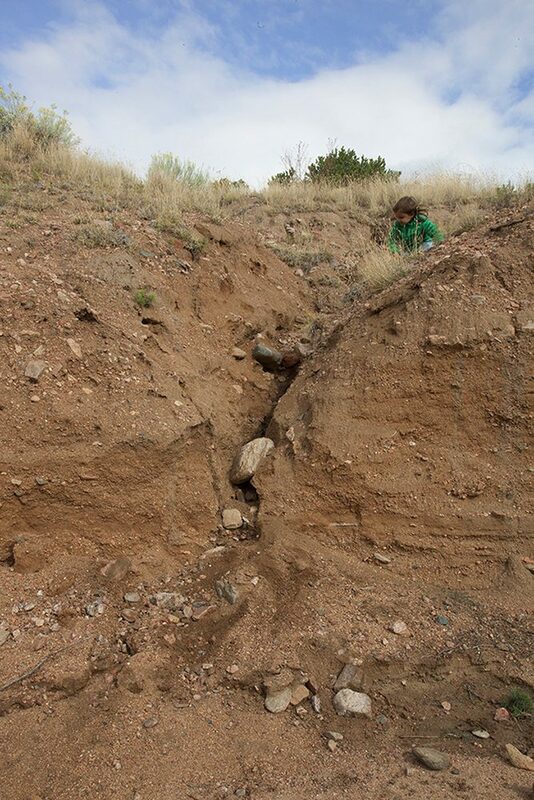 She is an Associate Professor in the Honors College at the University of New Mexico and an Adobe Educational Leader.